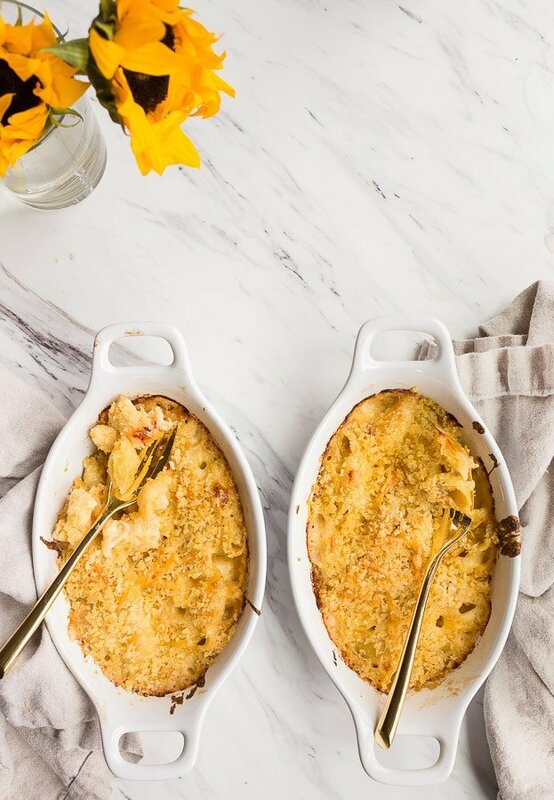 Lobster mac and cheese for two is the perfect romantic dinner for two! Easier to make than you think, and so decadent, too! In my nearly 9 years of blogging, I’ve never allowed a guest post on this site. If you’re unfamiliar, a guest post is when a new writer or recipe developer shares a recipe on a blog other than their own. It’s a great way to keep the free recipes flowing when you’re on maternity leave or a vacation, for example. But for me, I’ve always opted to just take a break. I never trusted anyone to develop small batch recipes for you. I have a long recipe testing process when scaling down recipes. Usually, I start with a full-size recipe, and then I cut it in half. The full-size recipe stays on the counter for side-by-side taste comparisons. From the halved recipe, I usually halve it again. This is where the problems usually arise–eggs cannot be halved and cups get split into tablespoons. This is the point that most recipes fail. Over the years, I’ve learned that a flat cookie needs more flour and possibly just the egg yolk instead of the egg white. I’ve learned that a sunken cake is usually from not enough leaveners, rather than too many. Also, I’ve accepted that sometimes, just serving fewer people is the goal, like with my banana sheet cake. It definitely serves more than 2, but significantly less than the standard sheet cake that serves 10-12. If you’re interested in my smaller sheet cakes, I have a Texas chocolate sheet cake and a Pumpkin Sheet Cake, too. They’re both soft, tender cakes on the thin side with warm frosting poured on top. Insanely delicious, if you ask me. 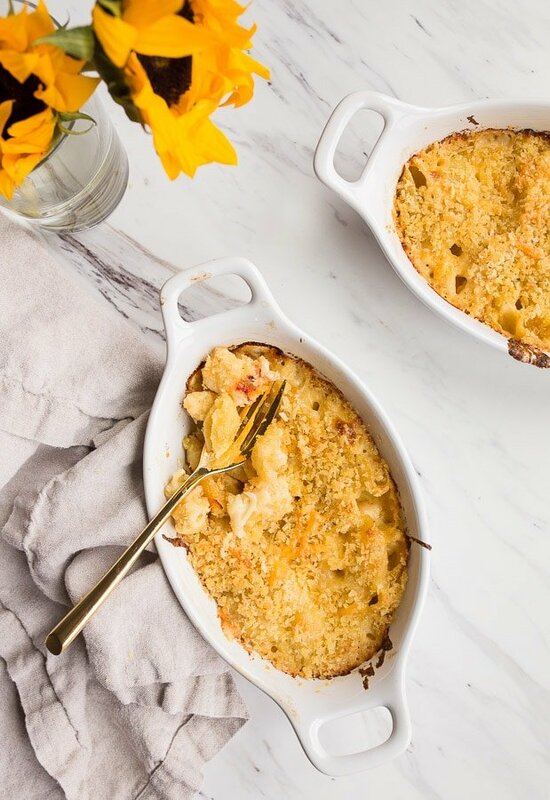 But back to lobster mac and cheese, this recipe is coming to you from my Mom! My Mom has dutifully recipe-tested for me over the years both with blog recipes and my cookbook recipes. I couldn’t do this job without her. She buys every small pan that I use, and makes helpful recipe notes, too! 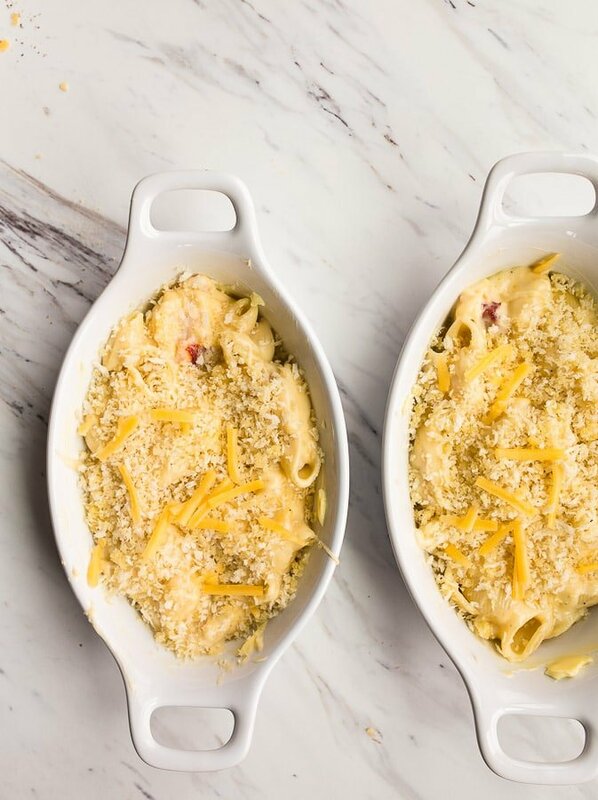 She scaled down this lobster mac and cheese recipe to be baked in two small baking dishes for Valentine’s Day. And while I’ve never been one to shy away from anything lobster, I worried you guys wouldn’t be interested in such a fancy dish. But my Mom assures me that a raw lobster tail is way more approachable than you think. It’s also widely available in most frozen seafood sections of the grocery store (including some Walmarts!). 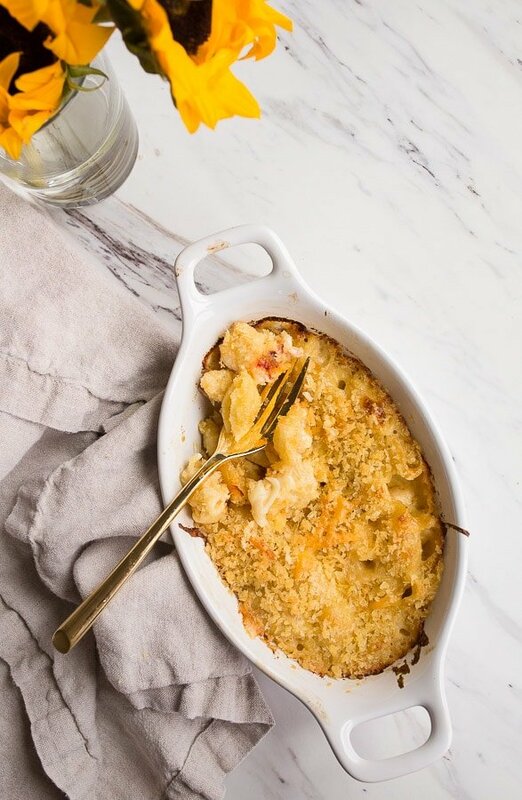 After tasting this lobster mac and cheese, I see the beauty of it, and it’s definitely our plan for Valentine’s Day at home. We still don’t know if we’re celebrating on the actual weekday or waiting til the weekend, but either way, this dish will be involved. I would serve it with a juicy Grenache if you’re a red wine drinker, or a Riesling that isn’t too sweet. The internet tells me a Lambrusco would be great, but I haven’t tried that yet! I have a collection of romantic meals for two at home, and also a chicken dinners for two recipe collection, if you’d like to browse that, too. We are all about staying in on Valentine’s Day in our house! 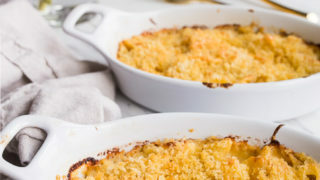 The baking dishes we use for lobster mac and cheese hold 0.6L each, and are the exact same one we use for Chocolate Cobbler. I found them randomly at the grocery store, but these gratin dishes are very similar. I’ve seen oval dishes that hold roughly 20 ounces of liquid at kitchen stores, too. You don’t have to use oval dishes, round ones are perfectly acceptable (and probably a little more common and easy to find). If small baking dishes are completely eluding you, dump the entire recipe into an 8×8 dish to bake. It will be a little on the thin side, but it’s okay, just keep an eye on it and bake it for less time. You might even need a few more breadcrumbs for the top. 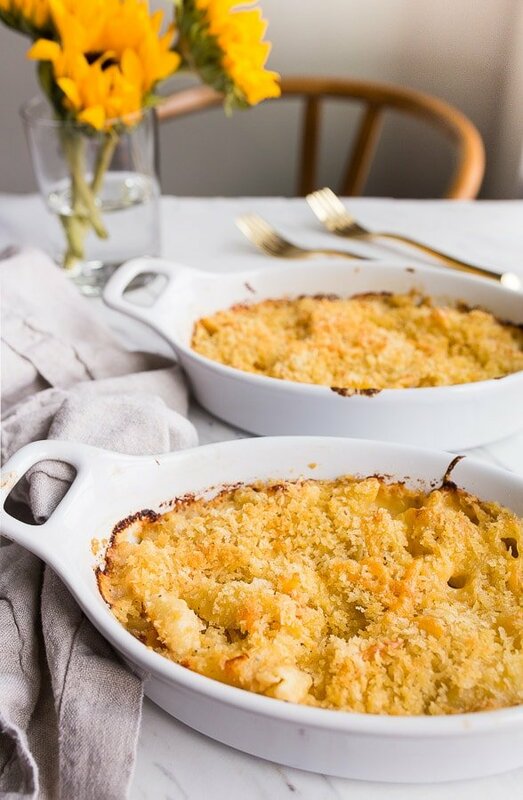 Speaking of breadcrumbs, I know that many people think a crispy crust on a pan of mac and cheese ruins it all, so if that sounds like you, leave it off. If you leave off the breadcrumb topping, cover the pan with foil before baking, ok? 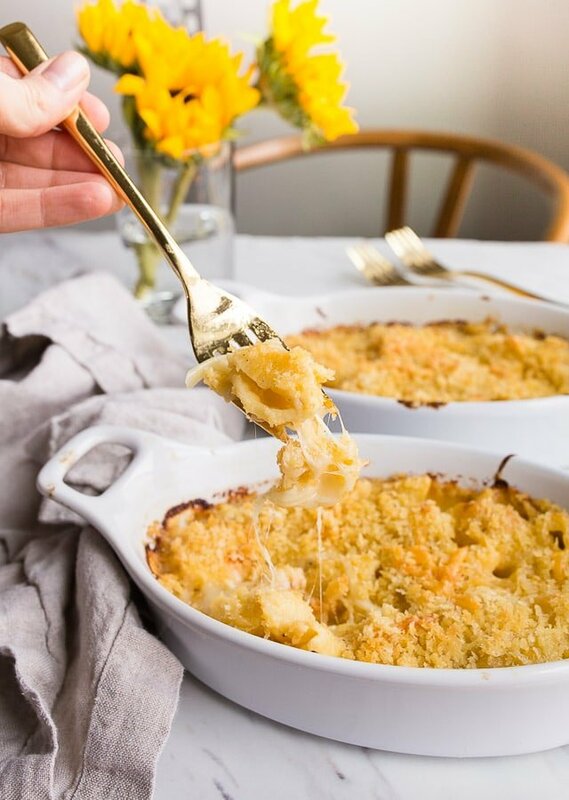 I happen to love a crisp topping on creamy mac and cheese, but make it your way. I hope you guys have a great Valentine’s Day planned! Even if you’re single, make this dish and enjoy one for dinner and the other one for lunch the next day. 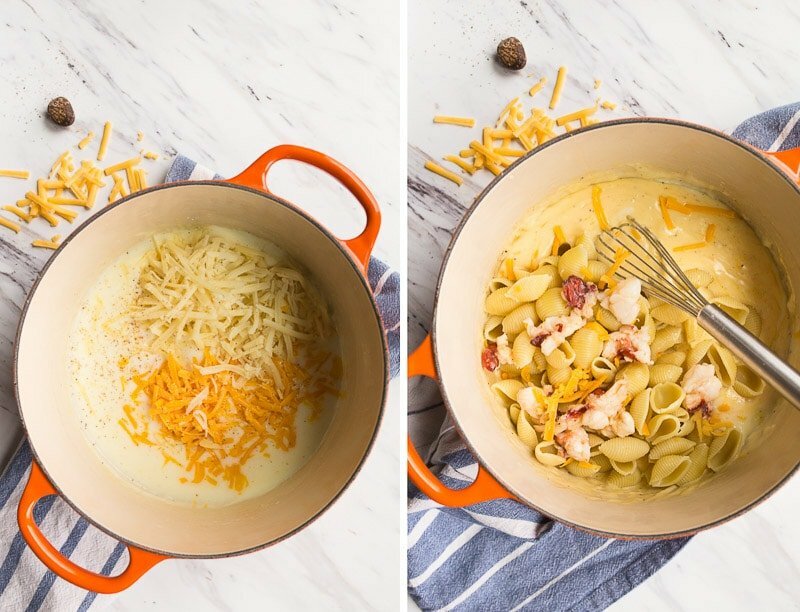 You deserve lobster mac and cheese, no matter what! I started writing this blog when I was single, and I was single for many years after that! I love the single life, and wish I could tell everyone to enjoy it while it lasts. While I did meet and marry a wonderful dude, the years I spent cooking for myself are such great memories for me. I taught myself how to cook using small batch recipes, and now that I have a family, it’s easier for me to tackle a larger recipe. But I really love when we keep it simple and bake date night dinners and desserts for two at home, too. If you make this for your Valentine, I would love to hear how it goes in the comment section! There’s also a star rating system in the recipe card, if you’d like to rate it. Happy Valentine’s Day, everyone! Make it cheesy and delicious for me, okay? Lobster mac and cheese for two. Preheat the oven to 375, and spray 2 oval 0.6L baking dishes lightly with cooking spray (or use extra butter to grease them). Bring a large pot of salted water to a boil, and cook the pasta until almost done (about 1 minute shy of package cooking time); drain and set aside. Using kitchen shears, cut down either side of the lobster tail, and remove the meat. Chop it into 1" chunks. 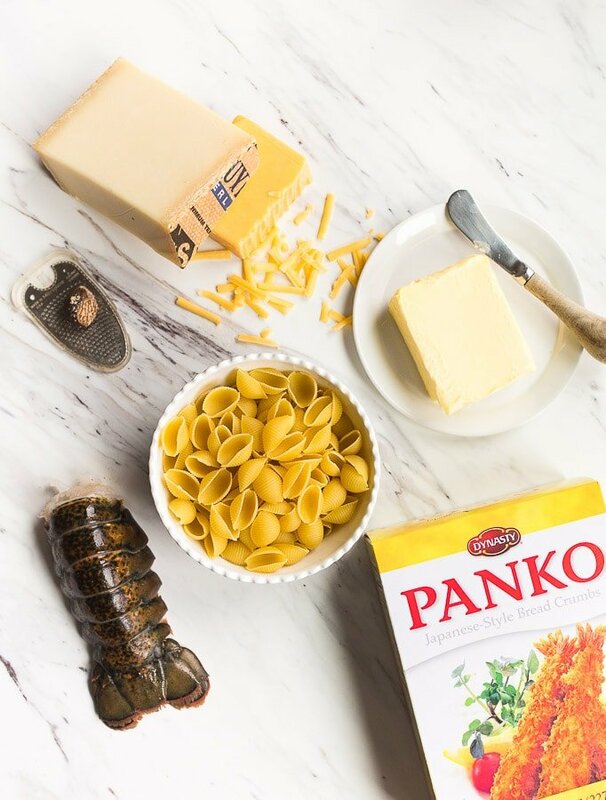 Melt 1 tablespoon of the butter in a skillet over medium high heat, and cook the lobster pieces in it while stirring occasionally for about 3-4 minutes. The lobster pieces will start to turn opaque and firm up; they will continue to cook in the oven, so remove them from the skillet and let cool. In a sauce pan, melt 2 tablespoons of butter over medium low heat, and add the flour. Whisk over low heat for 2 minutes, and then add the milk slowly. Cook this mixture until it thickens and coats the back of a spoon, about 4 minutes. Turn off the heat from the milk mixture, and add the grated cheeses, salt, pepper and nutmeg. Stir to melt the cheeses. Finally, stir in the cooked lobster and pasta, and stir to combine. Divide this mixture between the two baking dishes. In a small dish, melt the remaining 1 tablespoon of butter, and stir in the Panko bread crumbs to coat. Sprinkle this mixture evenly over both dishes. Bake for 20-25 minutes, until bubbly and lightly golden brown. Christina Lane is the author of 3 cookbooks all about cooking and baking for two. She has scaled down hundreds of recipes into smaller servings so you can enjoy your favorite dishes without the leftovers! Valentine's Day is her favorite holiday. Confession: I have never actually had lobster. Growing up in the south, it was a completely foreign concept for the longest time. Or maybe it was growing up POOR in the south that made it so foreign. Pretty sure there was probably lobster somewhere around here when I was a kid, I just never saw/experienced it. But all three of the Walmarts around where I live carry lobster tails now. I’ve stared at them with confused longing many times. So, that being said, I may just splurge a little this weekend, buy a lobster tail, some kitchen sheers (I don’t have those either! ), and some fancy cheese and make this for myself this weekend. I’ll be 40 in March so it’s dang time I eat lobster, right? And what better way to do so than in the food of life, Mac and Cheese?! I think you are the most awesome person. I love hearing about your relationship with your mom. You are truly the personification of the type of woman I hope my just-out-of-college daughters end up to be in a few years. Thanks for your tireless hard work and trustworthy recipes! A great tip for some extra lobster flavor, if you happen to have the head of the lobster, as well as the shell once you have removed the meat, I totally recommend making a quick stock first, with the head and shelll of the lobster (just put the head and sheel in water and let it boil for about some minutes, not much time is needed to get a nice quick stock) and then boil the pasta with it. I usually do it this way and the extra lobster flavor is amazing. It’s a quick trick and doesn’t take more than 15 min additional. That neat little trick goes for any shell seafood. I go to a lobster fest every spring. They also serve shrimp, crabs, etc. in the shell. I collect all the shells at the end of the evening and bring them home, cook up a hearty stock and into the freezer it goes. I usually can get a half to three quarters of a gallon stock. Break it down into individual cups in a zippy bag for future dishes. Well worth all the effort and work. Just made this for my hubby and I for Valentine’s Day. It was seriously SO GOOD. Maybe the best thing I’ve made. Thanks for sharing!! This is so delicious, my husband and I enjoyed making this together! Thanks for sharing a great recipe! I buy my own lobsters alive and steam them myself. Growing up a New Englander, I not only use the tail, but the claw meat of the lobster also. BTW, did you know there are right and left handed lobsters? Once in a great while, I will come across a lobster that has claws of equal size on both sides. I guess you could call it an “ambedextrious” lobster. Right handed lobsters tend to have more meat than left handed ones. Mac and Cheese is my favorite! I cant wait to try this! Dessert for Two® Registered Trademark 2013-2019. Dessert for Two® is a participant in the Amazon Services LLC Associates Program, an affiliate advertising program designed to provide a means for us to earn fees by linking to Amazon.com and affiliated sites. Howdy! My name is Christina. One day I started searching for dessert recipes that didn’t make so many servings. My search for small desserts turned up nothing. So I picked up my wooden spoon, half a stick of butter and set out to recreate my favorite desserts in smaller pans.